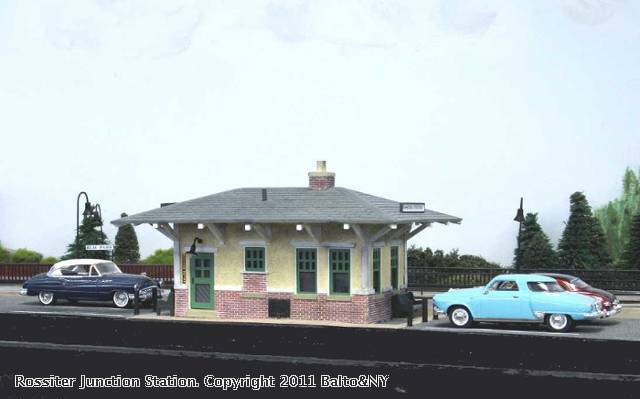 First, the P-ville station seen here has been worked over to represent a smaller ground-level suburban station. The bottom of the walls were cut off ane cemented to the top. One window was blocked off part way for a restroom. Brick was added below the window sills and rafters fitted under the roof. The rear door has windows cut into it. The station has a 1/4" thick foam core platform paved with printed brick paper. Lengths of old rail serve as parking lot collision posts. The black object on the lower wall is a Majestic coal chute door to a bin and furnace in the 'basement.' The walk on one side of the station has a flat cellar door in it. 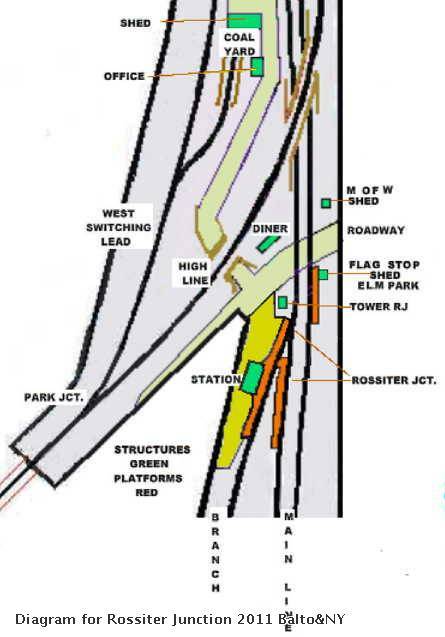 Next, the tower at Rossiter Junction is another P-ville piece that follows B&O standard plans from 1906! Here is has been painted B&O Indian Red wth black trim, used from 1925-1946. A small LP gas tank and new stack indicate the recent instllation of a gas furnace. This tower controls the switch for the Endsville branch as well as the gates for Highway 5. 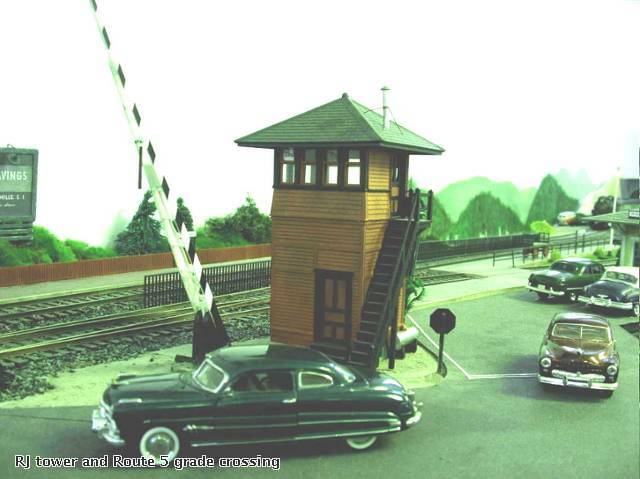 The crossing gates are Walthers items. A B&O RDC slows as it crosses Highway 5 for a stop at Rossiter Junction on the main line. A re-worked Plasticville signal bridge controls the junction to Endsville as well as a cross-over farther east on the main line. The switch and plaform for the branch track can be seen. Advertising signs for a Chevy dealer's "OK" used cars and a bank on Staten Island date back to the 1950s. Both are made of wood with computer printed ads. 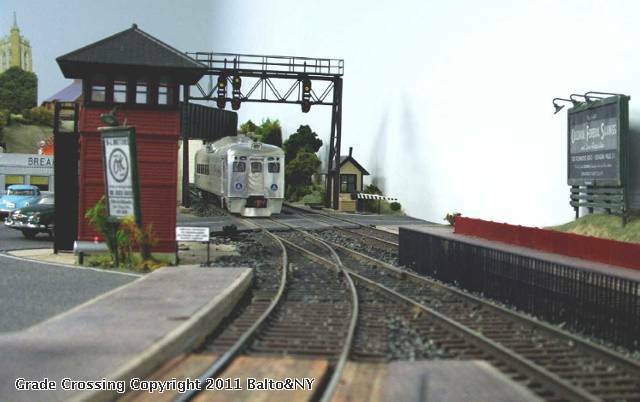 That little cream colored shed to the right is a Walthers pre-built, with its trim re-done in black. These were the standard B&O structure colors after 1946. 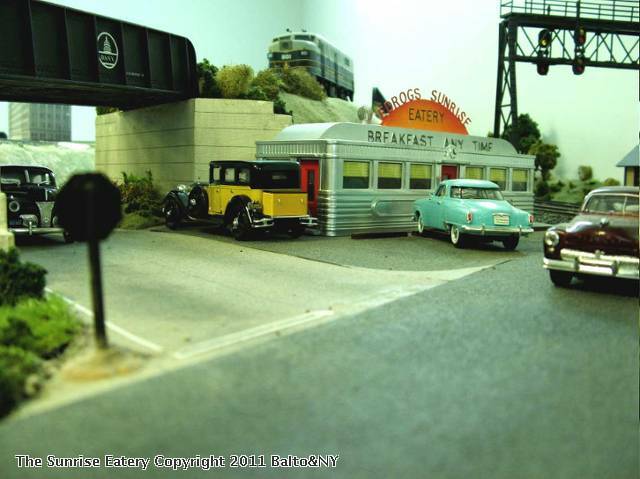 No junction and station on a highway is complete without a 24/7 diner! Here a P-ville diner wears an advertising header and the Plasticville name has been removed. Kitchen vents have also been added to the roof. The diner is on Highway 5 at the Back Road, which leads to a coal dealer's yard and Tower A on the B&NY. A B&O FA unit is running light down the high line to West Bridge and one of the holding tracks hidden under Endsville. Trains are staged there for operating sessions. OK, so that trailer isn't a P-ville item. Yet RJ tower is in the distance. A small shelter to the left of the tower is made from index cardstock. It was added to the east bound main track. It's a stand-in until a replacement shelter is built in styrene. The New Moon trailer was built in styrene and has four model airplane wheels. The Mercury Sun Valley convertible was fitted with a heavy-duty wheeled trailer hitch and sun visors, as well as a well-known couple (modified Circus Craft figures). They are still on an adventurous cross-country journey in their 'Long, Long Trailer.' Here they are, just after crossing the busy B&NY main line tracks at Highway 5 without incident. If you have followed this thread so far, here's a diagram which can help locate the above structures at this location on the B&NY. Elm Park was the east-bound main line flag stop, opposite Rossiter Junction station on the west-bound main and the Endvsille branch. It had a simple shelter following a 1906 B&O design. A cardstock mock up was used until such time as a permanent shelter is built in styrene. The M of W shed is a Walthers pre-built item that had its trim repainted for B&O's cream with black trim, the company's post 1946 structure colors.